Zuma's administration should face the law regarding Marikana: Malema - SABC News - Breaking news, special reports, world, business, sport coverage of all South African current events. Africa's news leader. 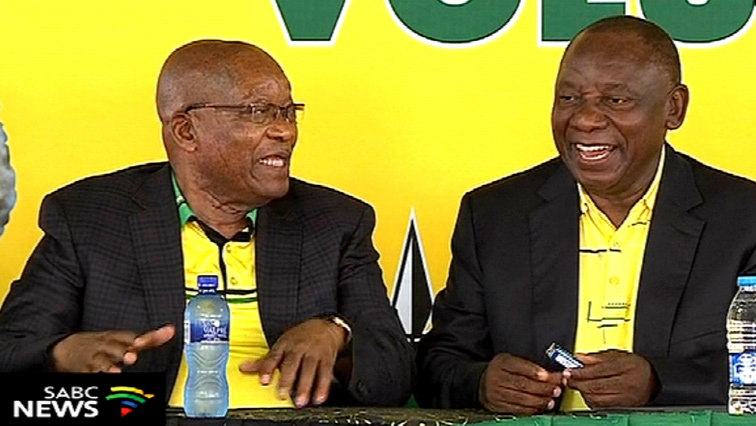 Former President Jacob Zuma together with current ANC President Cyril Ramaphosa at the ANC 107th anniversary celebrations in Inanda, KwaZulu-Natal. Economic Freedom Fighters (EFF) leader, Julius Malema, says members of former President Jacob Zuma’s administration should be tried in a court of law in connection with the Marikana massacre. Forty-four people were killed during a violent and protracted strike at the Lonmin Platinum Mine in Marikana in the North West in August 2012. Thirty-four were killed when police opened fire on the striking workers. Ten were earlier killed between the workers and the security guards. Malema said during the launch of the EFF’s 2019 Limpopo election manifesto in the mineral-rich Burgersfort in the Sekhukhune area, that if the EFF wins the upcoming general elections, it would ensure justice for the Marikana widows. “When the EFF takes over after the 8 May elections, the former president will be arrested, Ramaphosa will also be next one. They will be arrested in connection with the Marikana killings. They will be followed by Nathi Mthetwa and Susan Shabangu. Nelson Mandela will be smiling in his grave as the late Winnie Mandela would have given us a signal,” says Malema.